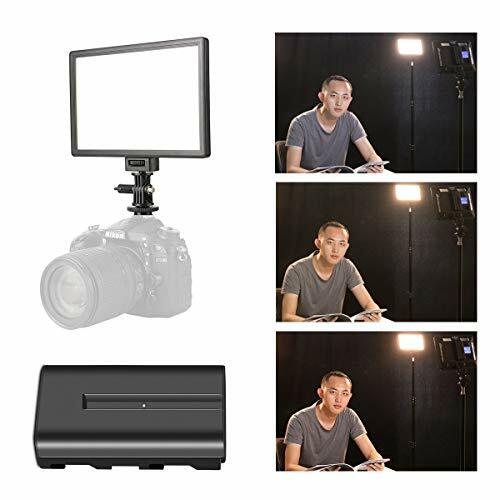 This L122T series video lights provides a functional and durable lighting solution for studio and workshop shooting, are excellent for macrophotography, photojournalistic and video recording, etc. --SUPON L122T LED light adopts newest LED honeycomb design . --It has high brightness ,nature and soft lights ,stable color temperature . --The high definition LCD display let the operation interface is clear . --You can adjust the brightness and color temperature steplessly . --It's suitable for portrait ,children ,wedding etc. --The hot shoe adopts durable metal baseboard . --It can be mounted on DSLR,DV camcorder and tripod . The LED Lights are guaranteed quality,there are the CE, EMC, FCC, RoHS certification.With LCD display which can show the brightness, color temperature and battery percent. More than 95% color rendering index (CRI) makes the picture much natural. The LED light work for Canon Nikon Pentax Samsung Fujifilm Olympus Panasonic and other brands DSLR cameras or camcorders and tripod ,video rig for better photography and video shooting. Two options for power supply: Rechargeable specific battery( inlude NP-F550 Lithium battery)/DC power adapter (not included in packing).